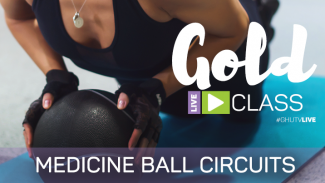 Join us for the this Get Healthy U TV live workout, exclusive to those with GOLD membership! Chris Freytag will lead you through this fun circuit training class using only body weight. Combine heart pumping cardio and strength moves to get a total body workout while torching calories. Low impact modifications are given so everyone can join in on the sweat session. End the class with a plank challenge! Get ready to bring your A game!